When it comes to repairing or maintaining European automobiles, our team at Bavaria Auto are the repair experts you’re looking for. From Audi and BMW to VW, Volvo and every make in between, your safety and attention to detail are our top priority. That’s why we’re committed to getting the job done right the first time. Whether you’re located in Falmouth or Fredericksburg, VA, we’re here to service your European automobile. From Aston Martin to Volvo, our team is here to keep your vehicle running smoothly. From routine maintenance like oil changes to heavy-duty repairs, we’ve got you covered. Schedule a service appointment today, or feel free to contact us with your automotive questions. I own a 1997 SAAB 900S and until finding this great repair facility my only choice was shops up north and they weren't inexpensive either. I am just glad to these folks and so does my car and wallet. Their knowledge is unsurpassed...just wish I had heard about them earlier. Talked to numerous shops about getting my 2003 Audi repaired, a friend recommended Bavaria Auto. The shop was very well supplied with the equipment to repair my European car. Douglas was very knowledgable. I was pleasantly surprised with the quality of work, reasonable price and time it took to repair my car. I will definitely go back! One of the most honest mechanics I have met. I own a LR Defender 90 and not always easy to track parts. Douglas (the owner), after making recommendations, allowed me to shop around for parts on my own to get the best deal and bring them in for installation. He provides quality service and is easy going. I highly recommend this shop. We specialize in all European Auto Repair & Service including Audi, BMW, Jaguar, Land Rover, Mercedes-Benz, MINI, Porsche, Saab, Volkswagon, Volvo and more. We do quality work at affordable prices because we are family owned and operated. We have access to OEM (Original Manufacturer’s Parts) and we offer military discounts. Learn more about all the services we offer for you foreign car here. 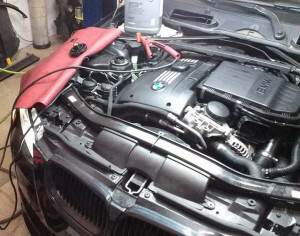 When it comes to repairing or maintaining European automobiles, our team at Bavaria Auto are the repair experts you're looking for. Your safety and attention to detail are our top priority. That's why we're committed to getting the job done right the first time.